True to form, Buffalo radio legend Sandy Beach provided a straight forward – no holds barred – acceptance speech. Displaying the sharp wit that has kept him on the top of Buffalo radio for more than three decades, Sandy provided the best example of why radio is so important. Janet Lomax, the first African American to host a major weeknight newscast in Rochester, spoke from the heart. Janet’s heartfelt comments demonstrated her ability to connect with the people of Rochester for more than three decades. 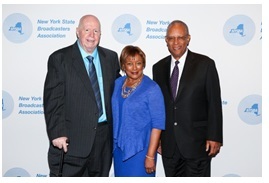 Art McFarland’s resonant voice filled the room as he described his years as an anchor, investigative reporter and education reporter for WABC-TV in New York. Art underscored the very reason for broadcast news. His unique ability to report on the tough issues confronting New York Schools made him the longest tenured reporter at WABC TV. We are honored to recognize all of these great individuals. By all accounts, including the luncheon within the NAB NY show was a tremendous success. We hope to see you next year!